A 4-year-old white rhinoceros who was inside an enclosure in a French zoo has been killed for his horn. "Vince," a young rhino at the Thoiry Zoo, was found shot in the head, and one large horn had been sawed off by a chainsaw, according to the Guardian. The animal's second, smaller horn was cut but not fully removed, which suggests that the poachers left in a hurry, police told reporters. "I was a bit surprised, but at the same time, it sort of seems like the next step in the crisis," Sieffert told Live Science. "The rhino-poaching crisis has been going on for years. It has been escalating for years. And I think we've now hit this point where they are targeting animals in zoos." The "they" Sieffert referred to indicates not opportunists or amateurs, but professionals. "Poaching is a criminal activity run by highly organized and sophisticated criminal networks," Susie Ellis, the executive director of the International Rhino Foundation, said in a statement. The main market for rhino horn is in China and Vietnam, Sieffert said. Buyers covet the horn for its completely mythical medicinal properties. (In fact, rhino horn is just keratin, the same stuff that makes up fingernails and hair.) Some also covet rhino horn for status, Sieffert said, and buy it as a display of wealth. As the price of rhino horn has skyrocketed, so has the motivation to poach rhinos. "The spike in the value is really driving the poaching crisis," Sieffert said. A recent report by an international consortium of conservation groups found that poaching has been on a stratospheric trajectory. In 2006, there were 60 confirmed poaching incidents in Africa. 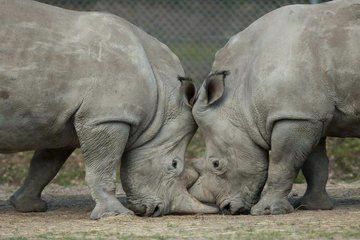 By 2015, at least 1,342 rhinos — including the white and black species of the animal — were killed in Africa in a single year. This poaching crisis is further jeopardizing a species that is already endangered. White rhinoceroses, like the Thoiry Zoo's Vince, came close to the brink of extinction before conservation efforts boosted their numbers: As of 2015, about 20,000 of the northern white rhino subspecies (Ceratotherium simum simum) were living in Africa, according to the same international report. The closely related southern white rhino subspecies (Ceratotherium simum cottoni) has only three living members, all of whom live under protection at the Ol Pejeta Conservancy in Kenya. Efforts are underway to develop in vitro fertilization procedures to keep the northern subspecies alive. The four other rhino species are facing serious challenges, however. The black rhino (Diceros bicornis) is critically endangered, with around 5,042 to 5,455 individuals left in the wild, according to the International Rhino Foundation. That's down from about 65,000 in 1970. The greater one-horned rhino (Rhinoceros unicornis), which is found in India and Nepal, is listed as vulnerable; there are about 3,600 in the wild. The critically endangered Sumatran rhino (Dicerorhinus sumatrensis) went extinct in Malaysia in 2015, and fewer than 100 still survive in Indonesia. The Javan rhino (Rhinoceros sondaicus), also critically endangered, is now found only in Ujung Kulon National Park on the island of Java in Indonesia. About 60 of these solitary animals survive. The Thoiry Zoo attack is not the only example of brazen attempts on the lives of rhinos. Just last month, two armed men stormed a rhino orphanage called Thula Thula in South Africa, holding the staff hostage and killing two baby rhinos that had previously been orphaned by poaching.